One day not long ago, two very frustrated parents were trying to pack their car for a week at the shore. As the father loaded the car with his hands full of gear, the pack n’ play he was carrying fell from his hand, causing a domino effect as everything collapsed around him. When they got to their beach house, they realized they had forgotten the sheet and two rods because there hadn’t been a place to put them. “There’s gotta be a better way!” he cried out. And the Bover was born. The Bover bag is a dream! We’ve all seen the ugly bags that pack n’ plays come with. 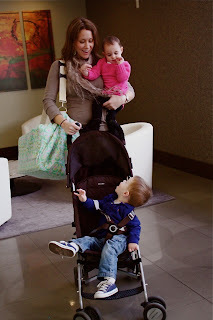 Sure they hold the pack n’ play, but they’re about as stylish as your a frumpy dress with no shape or color. The Bover bag is not only stylish, but truly functional. What I love most about the Bover bag is that they’re made with nice, thick and stylish fabrics that you will LOVE carrying around anywhere. And don’t think that you’re limited to using your Bover bag just for your pack n’ play! You can use the Bover bag to carry around laundry, toys or any other bulky items that you may need to tote around. The Bover bag also includes a nice adjustable strap that makes it easy to carry around, even when juggling a child or two. You can purchase a Bover bag of your very own at BoverBags.com. Believe me, this is an investment that you’ll be glad you made.